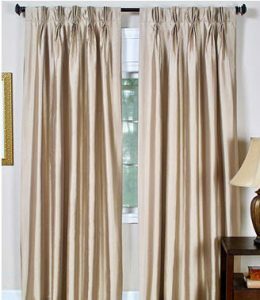 Your curtains should ideally be 4-6 inches wider than the windows and hang just below the ceiling, gracefully nearing the floor without touching it. By measuring to these lengths, even small spaces will seem more significant. Depending on the size of your room and what you’re using it for, the opacity you choose will be different. 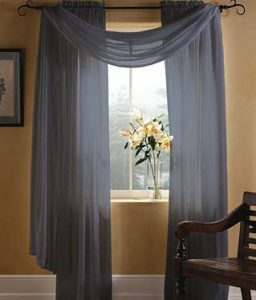 If someone will be sleeping during the day in the room, getting blackout curtains is a necessity. If it’s a common living space that’s small, getting sheer curtains that let in a lot of light will brighten the space and make it seem larger. Sheer lace panels add light and sophistication. 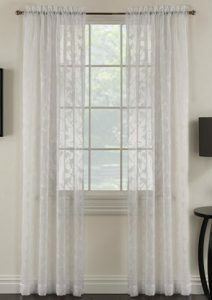 Miller Curtains Chickadee Sheer Curtain $10.99 Add some excitement with a sheer pattern. 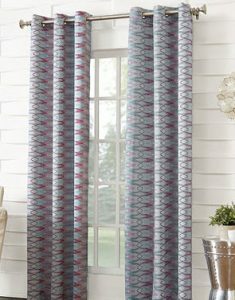 Lichtenberg Shiro Ikat Sheer Curtain $15.97 Pops of color liven up the room. 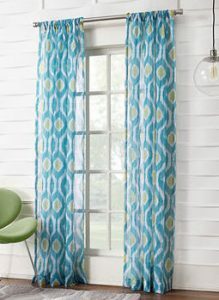 One exception for any room: if you have a lot of windows in one room, energy efficient curtains are for you! These special window treatments fall more under the blackout category and help keep excessive heat out and keep your cooling bill low. While curtains can be the inspiration for how the rest of your room is decorated, they are often an accent added after paint colors and furniture have been decided upon. This makes it a bit more of a hunt to find window treatments that coordinate with your look. But it’s not as hard as it seems. Start by finding the colors in your room that you most want to highlight. Are you in love with your paint color? Is there a piece of wall art that speaks to you? Maybe you’ve got a rug that’s magnificent. Take a close look at the color or color scheme and style within it and make it your mission to find something that complements it. This blog has some nice pointers on color matching. Once you’ve determined the size, opacity and colors you’re looking for, you can go out into the big, bad world on a hunt for perfection. It can take some time to find the right curtains, so don’t commit to the first ones that might work if you aren’t in love. Many online stores like Macy’s have awesome filtering tools that allow you to narrow your search to the size, opacity, color and price you’re interested in. Macy’s curtains are reasonably priced, ship free after $50, and have an easy return process if the items you choose don’t work in your space. Getting the right window treatments for your home doesn’t have to be an intimidating task. Take the time to really figure out what you’re looking for and search for it online. 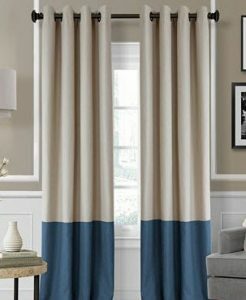 It may take some time, but with patience, you’ll find curtains that will seem more like an investment than an expense!